This badge was issued to DUANE ARITONANG on 31 Oct 2016. 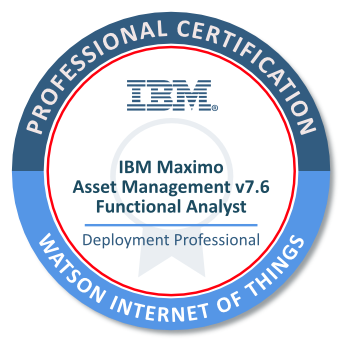 The badge earner is a technical professional responsible for supporting, implementing and maintaining an IBM Maximo Asset Management v7.6 solution, and the asset life cycle including inventory, contracts, purchasing, resources, work management, preventive maintenance and security. This individual is able to perform these tasks with limited assistance from peers, product documentation, and support resources.